This shows the station in its original form, without the ticket extension to the rear and with herringbone brickwork in the south wall. There is a tantalising glimpse of the wooden engine shed which, until 1894, was situated on a siding behind the end of the platform. 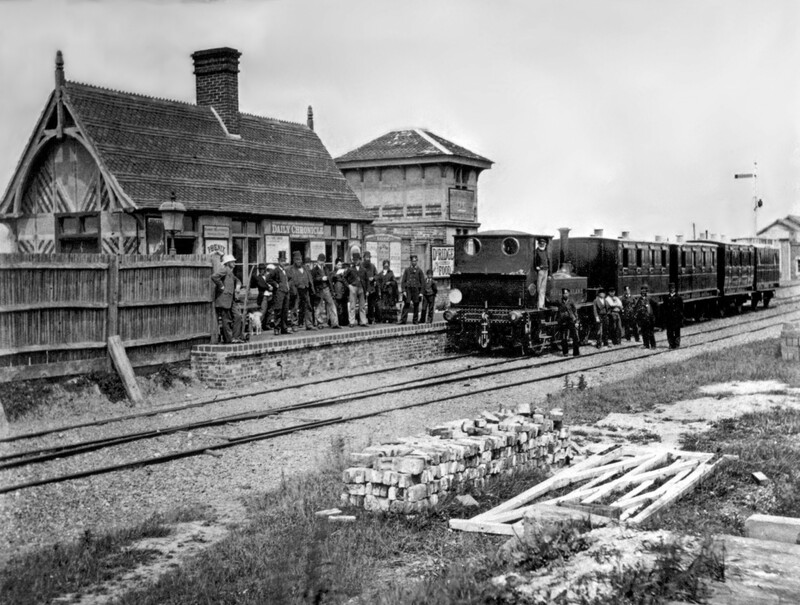 The engine shed was originally at Petworth, whilst that station was a temporary terminus and probably was moved to South Hayling soon after the LB&SCR began to operate the train service from the 1st January 1872. The original flat bottomed rail and half round sleepers are clearly shown. Was the original platform a timber construction, as at Langston? The bricks in the foreground may be evidence that the platform had been recently rebuilt and perhaps raised in height. Note the very tall starting signal, which is marked on the map of 1872/3, together with a signal 400 yards to the north, which may have been a home signal or a fixed distant. A third post shown behind the platform must be a cartographical error. 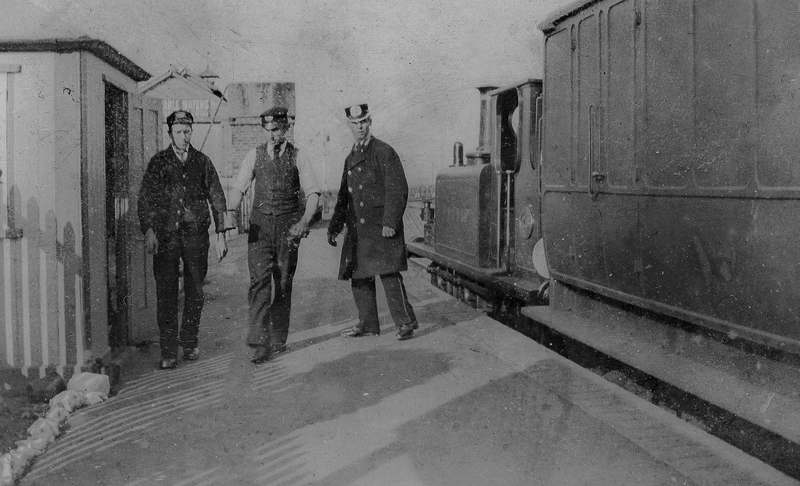 If this photograph is close in date to the 1881 census then the station master in top hat could be Harry Mitchell and the guard, standing next to the boy by the locomotive, Robert Outen. The engine driver on the footplate would be Edward Reay and the fireman either Henry Downton or John Tilley. The man on the extreme left is reputed to be the coachman of the Royal Hotel, Frederic Court (3). The locomotive in the photograph is the Sharp Stewart 2-4-0 Hayling Island: had the number been legible it might have narrowed down the date, as it was renumbered in 1874 and again in 1877. The two leading coaches are Seconds from c1860, with at least one probably downgraded to a Third, the next is a three compartment First and bringing up the rear is a one compartment Brake Third with a luggage compartment. 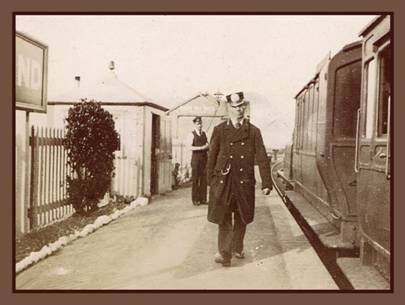 Two photographs from the 1890s have recently come to light showing the Terrier Knowle in the platform at the terminus, with a Stroudley 20’ Full Brake. From evidence of photographs in the following decade, the branch train now consisted of Brake Third, Composite, Third and Full Brake. The first photograph (6) shows a little more of the engine shed and water tank, behind which was hidden the coaling stage and small signal cabin. The starting signal is shorter than the one in the NRM photo. The engine shed closed in 1894, after which the branch engine was based at Fratton. The condensing pipes were removed from Knowle in 1894 but the angle of the photograph makes it impossible to verify whether they are still fitted. The photograph may be a little earlier: four Terriers were transferred to Fratton in the early 1890s but with the withdrawal of No 497 Fratton in 1890 and the conversion of No 499 Hayling Island in 1889, this left only the Kitson 0-4-2 Bognor to work the line (7). According to the same source Bognor was transferred to Eastbourne in December 1891 and was scrapped in 1894, so Terriers must have been in use soon after 1890, even if only as spare engine. A second photograph (8), apparently taken on the same day, has identified the guard as Robert Outen. He was promoted to guard on the Hayling branch on the 12th March 1879 at a wage of £1-4s-0d per week. He held this position until forced to retire because of ill health in 1899. The porter in 1891 was Thomas Wade. The last two letters of the running in board “ND” confirm that the photograph was taken after the renaming of the station in June 1892. The 20’ Brake Van has a destination board mounted above the ducket and, unusually, the ducket is facing inwards. Could the attractive wooden building on the platform in the second photograph be the ‘cramped wooden goods shed built by the Hayling Railway‘? (4). The porters already had their own accommodation in the station building. The first evidence of a goods shed is when a lock-up goods shed was authorised on the 17 September 1894, to be supplied by S. Taylor and Co. for an estimated £30 (5). This was presumably to the standard LB&SCR design but, uniquely, it was to be clad in corrugated iron, which may explain why the price was much lower than the standard £50 for lock-ups in this period. Little is known about the limited goods traffic on the branch in the 19th century: coal had been imported through nearby Mill Rythe and the quay at Langston dealt with substantial imports of ’coal, building materials, timber, gravel and ballast’ (4). By 1890, silting up of the harbour had ended this trade and it may be no coincidence that the LB&SCR Engineering Committee Minutes of the 14th July 1890 authorised an additional 450’ siding to be laid at the terminus, confirming that only one goods siding had existed previously. In 1877 a gas works was established adjacent to South Hayling Station, which would have provided an additional source of revenue. In 1900 ‘coal, seed potatoes, fertiliser, cement and small items for local shops comprised the traffic’ (4). No trains in the 19th century timetables were marked as being “mixed” and Geoff Smith has quoted an entry in the Working Timetable of July/August/September 1895 : ‘Goods worked by Passenger Train. Trucks are attached behind, an extra Brake Van must be attached and the extra Guard to ride in same’. Was a porter or other member of staff from Havant or Hayling Island authorised to act as the extra guard? The collision in October 1892 at the terminus between coaches standing in the platform and an incoming train of four wagons of oysters from Whitstable and a brake van is evidence of one dedicated goods train but that appears to be an exception. The original timetable offered by Furniss of six trains in each direction on weekdays was over optimistic and was soon reduced to four. The LB&SCR continued with a similar frequency but, by 1880, this had increased to seven. The 1898 timetable showed ten trains each way on weekdays and seven now on Sundays. Evidence of the increased traffic is the acceptance by the LB&SCR on the 8th December 1896 of a tender of £184.10s.0d for the ‘erection of a new ticket office, platform roof etc’ (5). A engineering drawing of the extension and the station building and canopy has been deposited in the Bluebell Railway Archive by Alan Bell (1). This proves that the platform awning was erected in two separate stages: it was the original section of 1896 that was demolished during or soon after the Second World War, having suffered bomb damage. In 1897 a deputation of local people asked the LB&SCR to double the branch and improve accommodation at the terminus. On the 13th October the Engineering Committee declined the first request but were willing to consider the second. The branch was relayed with bullhead rail in 1898 (4) but otherwise no other improvements were made and on the 1st April 1899 the Hampshire Telegraph reported that local dignitaries had met the General Manager of the LB&SCR. This time action was swift: the following month the Engineering Committee approved a tender of £245 for the extension of ‘platform accommodation‘. This work had to be re-tendered in March 1900, due to the failure of the previous contractor. On the 11th April authority was given for the removal and re-erection of the coaling stage and the water tank (though the latter was never re-erected) and the extension of the platform according to Plan 3804, the cost being £450. A tender from Mr J Clinker of £950 was accepted on the 4th July for the new brick goods shed and office. The only modifications to the track plan were the addition of a third goods siding and the extension of the former engine shed siding to form a bay platform. All alterations to the terminus appear to have been completed during 1900. An official LBSCR drawing dated 1st January 1900 in the author’s possession shows the platform canopy extended and the bay platform already in existence but with the track layout and the platform length unaltered. The Committee Minutes prove this to be incorrect. Why was a bay platform provided? Photographs show that for many years it was only used for the purpose of storing spare stock and there was no provision in the pre-1923 timetables for two passenger trains to be in the terminus at the same time. In August 1870, Furniss arranged with the LSWR for special excursions to be run daily from Portsmouth to view the Summer Encampment of the Hampshire Rifle Volunteers. Otherwise no evidence has come to light for through excursion trains to Hayling Island in the 19th century and access to the main line at Havant was awkward until the modifications of the late 1930s. Press reports of later Encampments state that the troops travelled by timetabled train or disembarked at Havant and proceeded by road. The fourth photograph from a photograph c 1904 clearly shows the new ticket extension, still with herringbone brickwork. The gable end of the station has been clad in grey slate, though this and the ticket office were clad in red tiles shortly afterwards; these surviving until closure. The extended canopy is very evident, two new starting signals have been installed and the new goods shed and the repositioned coal stage can be seen to the right. A new signal cabin, to a later LB&SCR design, can be seen at the end of the platform. The enginemen’s mess cabin, prominent in 1950s photographs beside the bay starting signal, was almost certainly the original signal cabin: apart from a modified window facing the station it was identical to the cabin at Langston and a similar cabin appears in an early photograph of Rudgwick. The 5 coach branch train has been strengthened with two additional Third Class coaches at the front and the date may be Whit Monday 1904 (10). Peter Paye (4) described an ambitious scheme of 1886 to join the branch to an extension of the Southsea Railway, by means of a road and rail bridge over the entrance to Langstone Harbour but this came to nothing and the terminus remained largely unaltered until closure. Footnote: on the 5th May 1904 the West Sussex Gazette announced that ‘ the LB&SCR is to strengthen the swing bridge at Langston, after a decision to run main line trains to Hayling Island‘. Had this occurred then the history of the branch would have been very different and rather fewer Terriers might have survived into preservation. 2/ Photo 683/63 reproduced courtesy of the National Railway Museum/Science & Society Picture Library. By Reeves and Hawkins. Wild Swan. 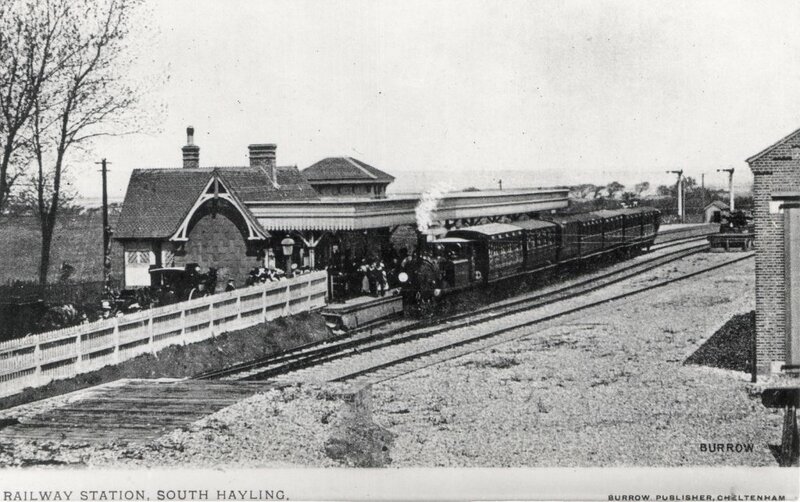 4/The Hayling Railway by Peter Paye.Oakwood Press. 7/Locomotives of the LB&SCR by DonBradley Vol 1 published by the RCTS. 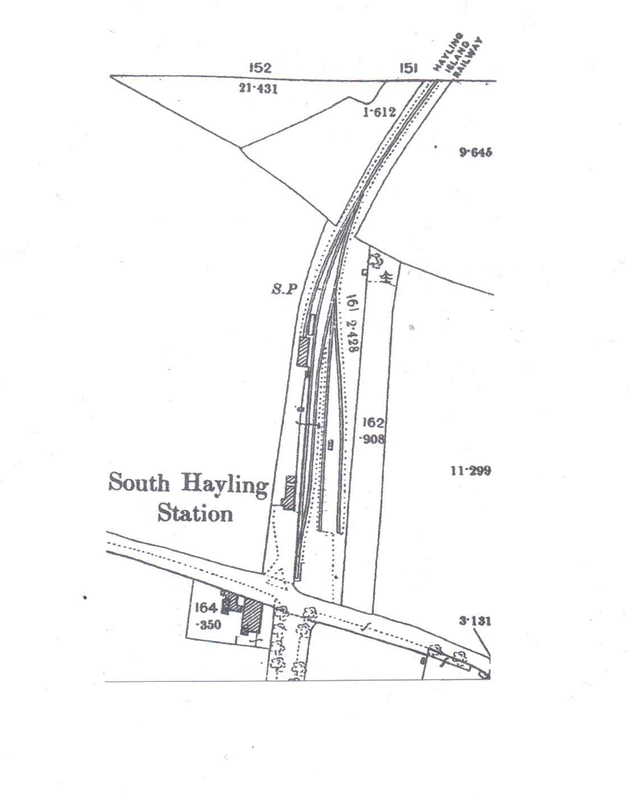 8/LB&SCR plan of Hayling Island Stationdated 1st January 1900 and initialed J.S.T.in the author’s possession. Acknowledgment is given for the help given by Peter Drury and his website www.haylingbilly50.co.uk, commemorating the 50th anniversary of closure in November 1963.